A 3000-kg cannon is mounted so that it can recoil only in the horizontal direction. (a) Calculate its recoil velocity when it fires a 15.0-kg shell at 480 m/s at an angle of above the horizontal. (b) What is the kinetic energy of the cannon? This energy is dissipated as heat transfer in shock absorbers that stop its recoil. 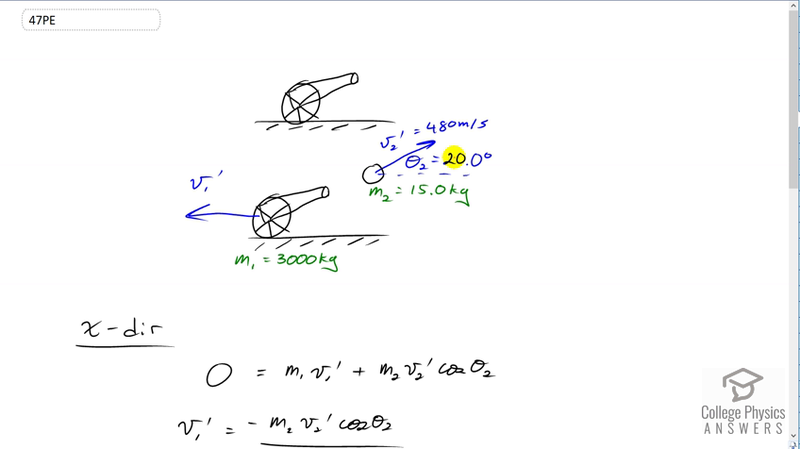 (c) What happens to the vertical component of momentum that is imparted to the cannon when it is fired? c) The vertical component of the momentum of the shell is given to the Earth. This is College Physics Answers with Shaun Dychko. This cannon and cannon ball are initially at rest and then the cannon fires the cannonball out. It goes at an angle of twenty degrees above the horizontal at a speed of 480 meters per second and it has a mass of 15 kilograms. We're told that the cannon itself will go straight backwards and has a mass of 3000 kilograms. So using conservation of momentum in the x direction, we'll say that initially there is no momentum because nothing is moving. That will equal m one v one prime after the firing of the ball plus m two v two prime times cos theta two because this gives us the horizontal component of the momentum of the cannonball. So we consider this yellow triangle here and we're looking for the adjacent leg of that triangle so we multiply the hypotenuse which is m two v two prime by cosine of theta two. We'll solve for v one prime by taking this term to the left side by subtracting it from both sides and then switch the sides around, then divide by m one. So we have v one prime is negative m two v two prime cos theta two divided by >i>m one. So that's negative 15 kilograms times 480 meters per second times cosine of 20, divided by 3,000 kilograms which gives negative 2.26 meters per second. The negative sign means that the cannon is moving backwards since we've taken to the right to be positive. The kinetic energy of the cannon is one half multiplied by its mass times its speed squared. That's one half times 3,000 kilograms times negative 2.25526 meters per second squared, giving us 7630 joules to three significant figures. The vertical component of the momentum of the cannonball is given to the earth and so the earth will recoil. But of course, its recoil velocity will be imperceptible since the earth is so massive.